Germain’s artistic achievements are more amazing than his radical schemes in a video game. Silversmith François-Thomas Germain features prominently in the game Assassin’s Creed: Unity, set in revolutionary-era Paris. Millions of gamers worldwide now know his name, his imagined role as Templar Grand Master, and his fictitious death year of 1794 during the Reign of Terror, when 818 “suspects” were guillotined in a single day. In fact, the notorious game character is now much more famous than the real one on which he is loosely based. 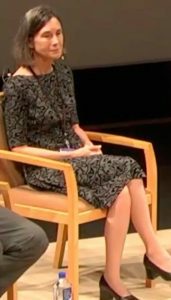 If you do a Google search, you’ll see that online, the historical Germain and the fictitious one have become hard to tell apart. As a curator responsible for French decorative arts at the J. Paul Getty Museum in Los Angeles—which includes objects by the true artist—I’m fascinated by the rich visuals of the game and its power to shape how we see the past. I’d like to introduce you to the real Germain and show how some of his artistic achievements are more amazing than his radical schemes in the video game. In Assassin’s Creed: Unity, we encounter Germain in 1791 as he finishes an intricate initiation pin for the Templar Order, a military society that believes wise rule shepherds people away from sloth and wickedness. His pin contains a cunning invention: a hidden channel capable of dispensing a lethal dose of poison. This weapon is the smallest and most discrete in the combined arsenal of the opposing orders of the Templars and the Assassins, who believe in individual free will. No longer a respected craftsman, Germain is an extremist within the Templar Order, a follower of Jacques de Molay, and a sage. He uses fear and violence to incite civil disorder, bring down the monarchy, eliminate the moderate Templar leadership in Paris, and control society at large. Why was a French silversmith chosen as a key player in a video game? Ubisoft historian Maxime Durand told me that Germain “captivated us quickly with his real-life talent and ultimately his unexplained demise.” His profile was unique, Durand said, and thus worked well with a secret story. Rather than dying in 1791 (as he did in real life), in the game Germain goes underground to avoid retaliation from rival elements of the Templar order. The real François-Thomas Germain was no revolutionary or murderer. He was instead the greatest silversmith of his generation. Germain transformed cold, lifeless metal into sculptural objects that rivaled the forms of nature: clumps of earth, wrinkly truffle mushrooms, beaded cauliflower heads, downy-soft rabbit fur, rumpled feathers, smooth beaks, and even twigs of coffee berries and leaves. Cast from molds and models of actual plant and animal specimens, each part was painstakingly finished to a high degree of realism. With dozens of specialized chasing tools and burnishers, he achieved a surprising range of contrasting textures and smooth surfaces that masterfully manipulated light, reflection, and optical perception. Visually astounding, his pieces embodied the Enlightenment’s quest to understand and accurately portray the natural world. 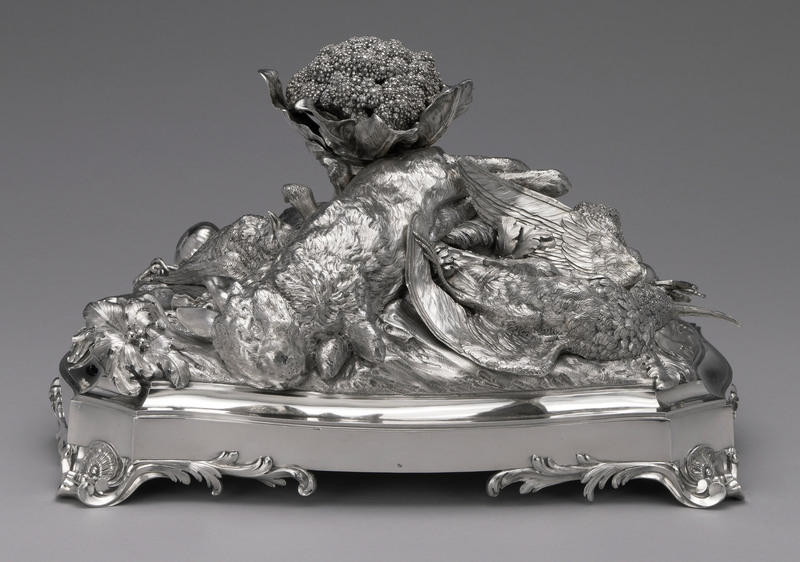 Germain was born into a famous dynasty of Parisian silversmiths. At age 22, he was named “sculptor-silversmith to the king” by Louis XV and granted free lodgings in the royal palace in Paris that now houses the Louvre Museum. Germain managed a large, busy workshop of craftsmen that made dazzling works for French royalty and foreign courts across Europe, from Lisbon to Saint Petersburg. They specialized in luxury wares such as table centerpieces, serving vessels, condiment dishes, pots for coffee, tea, and chocolate, wall lights, candlesticks, and inkstands. 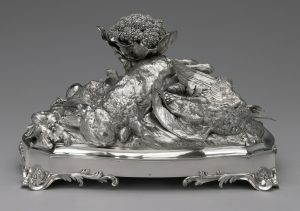 The centerpiece shown above, for instance, was commissioned by the duke of Mecklenburg-Schwerin in Germany, while the coffee pot was ordered by the king of Portugal. 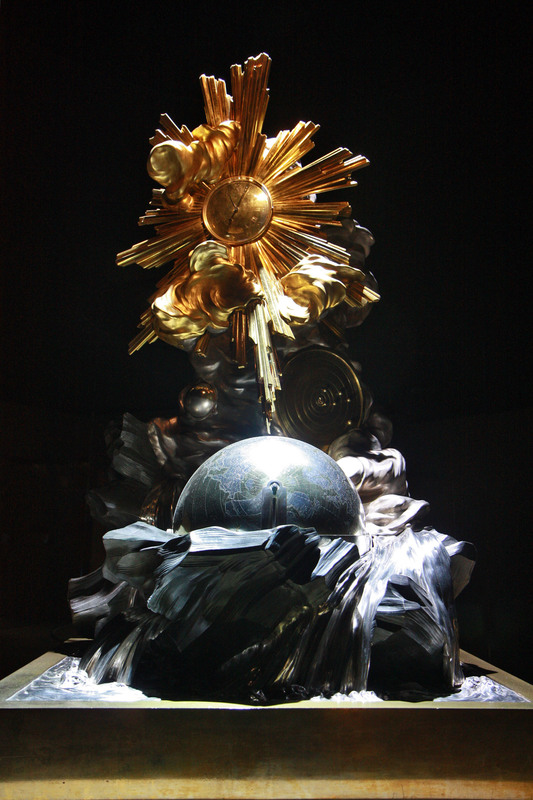 In 1752, at the peak of its productivity, Germain’s workshop cast and finished approximately 497 kilograms of silver—half a ton! He engraved the best pieces with his name, title, prestigious address at the Louvre, and year. Modern-day art historians, curators, and collectors appreciate this practice each and every time we find the inscription “made by F. T. Germain, sculptor-silversmith to the king, at the galleries of the Louvre in Paris.” You can see it here in a detail from a large bronze wall light, whose gilded surface reflects and amplifies the flickering flames of the candles set into its branches. The historical Germain was not a member of the Templar Order, and he died in 1791 (not 1794)—on January 23, at the age of 64. Despite his early successes, he ended life in relative poverty. In his mid 40s he fell into financial difficulties, declared bankruptcy, and was ejected from the guild of gold- and silversmiths. To see what I mean, let’s follow the story of this wall light. 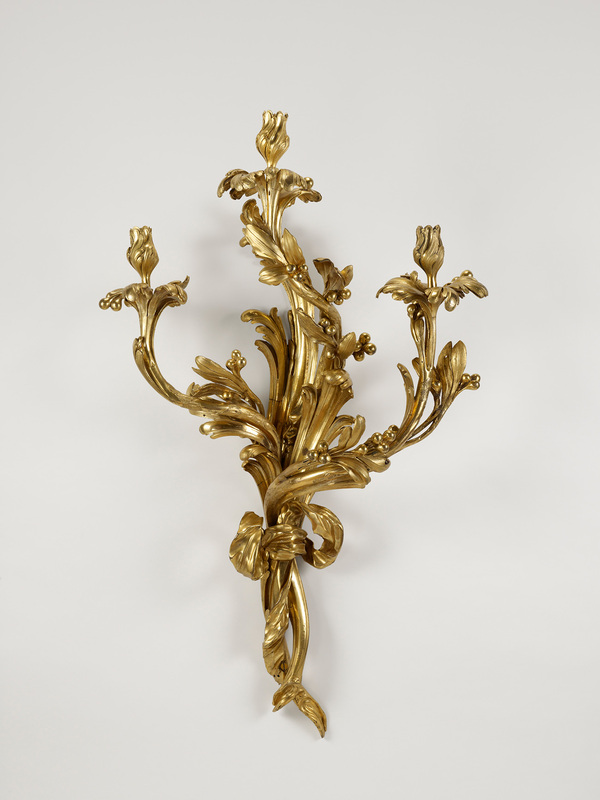 This wall light is one of an original set of eight; four are now at the Getty Museum in Los Angeles. The lights are cleverly designed as large sturdy branches of bay laurel, tied together by billowing ribbons. The tips of the branches morph into candle holders and drip pans for melted wax. 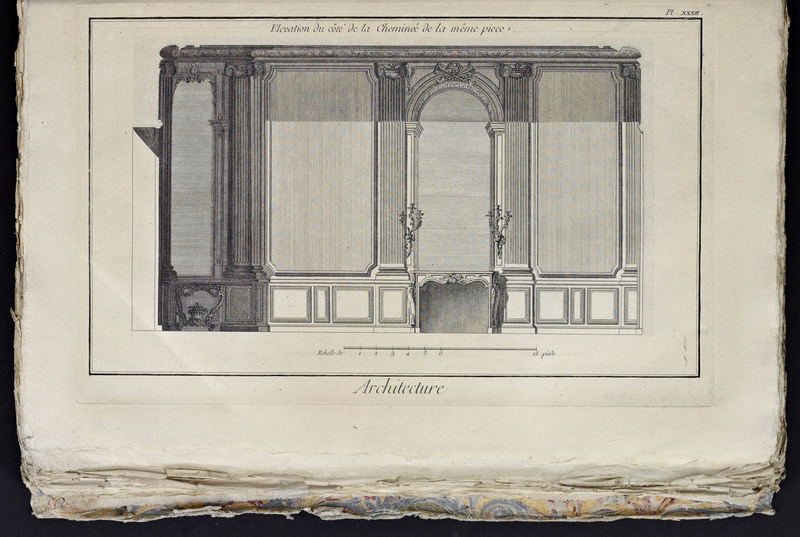 The full set was made in 1756 for the newly refurbished interiors of the Palais Royal, the palatial Parisian residence of Louis XV’s cousin. 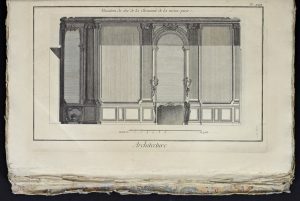 We can see how the wall lights once hung on the wall there in this 1762 engraving published in the Encyclopédie (Encyclopedia), a vast set of books that aimed to summarize all human knowledge. Thirty years later, the future revolutionary known as Philippe-Égalité inherited the residence and its contents. In 1786 he sold the wall lights through an intermediary to the French crown. Two pairs went to furnish Queen Marie Antoinette’s Room of Nobles at the castle of Compiègne; the other two pairs were sent to an elite military school, l’École Militaire in Paris. 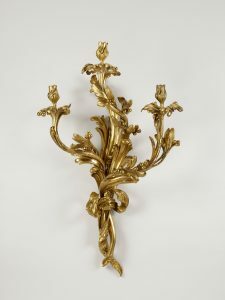 When the French monarchy was abolished on September 21, 1792, the wall lights at Compiègne became the property of the new French Republic. In 1795 they were transferred to adorn another seat of government, Luxembourg Palace in Paris, where they remained for decades. By that point, their former owner Philippe Égalité had been guillotined. We don’t know exactly what happened to the wall lights over the next one hundred years; I am researching this question now for an online catalogue of the collection. Only four of them reappear in the historical record in the 1920s, in the collection of an English aristocrat. All trace of the four wall lights sent to the military school ends in 1792. Were they damaged, melted down for their metal, or lost? Do they survive? In a postscript at the end of Unity, we learn of the fictive Germain’s ignoble demise: his bones are scattered among others in an obscure corner of a Parisian catacomb. The legacy of the historic Germain, on the other hand, is spectacular and enduring. Today, public museums in Lisbon, Paris, Saint Petersburg, New York, Boston, Los Angeles and many other cities preserve great examples of his work. Check out just this one piece—a tour-de-force—at the Louvre Museum to grasp his truly extraordinary skill, and you may find yourself inspired to mentally redesign that Templar badge. This entry was posted in Art History, Enlightenment, History. Bookmark the permalink.